How has the number of platforms changed over time? While it is likely that the CrowdingIn directory does not include every single UK-based platform that has ever existed, we believe it is comprehensive enough to give us a strong indication of platform trends. 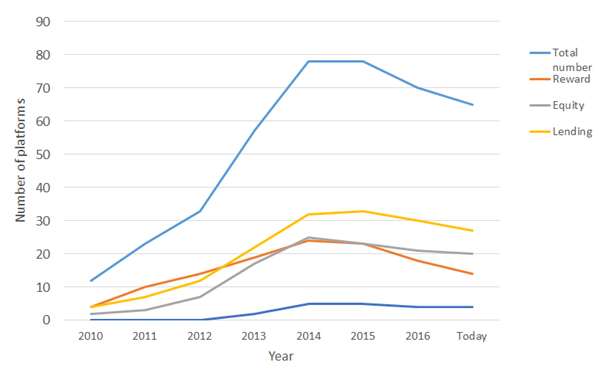 The number of UK platforms on CrowdingIn grew rapidly between 2010 and 2014, from a dozen in 2010 to 78 in 2014; more than a sixfold increase in just four years. Between 2014 and 2015, we saw a plateau in the number of platforms followed by a slight decrease, taking us to the current number of 65 active platforms. From this data alone, we cannot be clear as to whether this decrease in the number of platforms on the CrowdingIn directory reflects reality, or is simply a result of decreased use of the directory itself. However, the decrease in the number of active platforms does correlate with the marketplace finance data provider Tab’s observation that fewer new platforms launched in 2014 compared to the previous year. Between 2012 and 2014, the increase in the number of platforms was particularly rapid for the equity-based model; growing from just seven to 25 platforms in two years. The increase in the amount raised through equity-based crowdfunding in this time was even greater, growing by 410 per cent. The rapid increase in equity-based platforms and the amount raised through them may in part be explained by the introduction of the Seed Enterprise Investment Scheme (SEIS) in 2012, which provides tax relief of 50 per cent on equity investments into early-stage companies; including those made through crowdfunding platforms. The plateau and subsequent decrease in the number of platforms from 2014 onwards may be explained by a saturation of the market as smaller platforms struggle to attract a viable number of projects and investors. 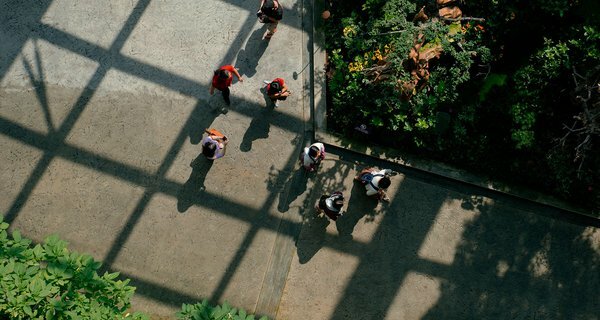 Market saturation may also explain the growing trend for new platforms which focus on specific types of projects as these new companies try and find their niche in the market. The plateau and then decrease in investment based platforms (i.e. equity and lending-based platforms), may also have been influenced by new FCA rules introduced in April 2014 which aim to protect crowdfunding investors, but which have inevitably made it more difficult to set up an investment based platform. Despite the decrease in the number of platforms since 2014, research has shown that the amount raised continued to grow, suggesting that we are seeing some consolidation of the market rather than a decrease in its overall size. While a decrease in the number of platforms means less competition, it may benefit investors by making it simpler to directly compare different deals which would otherwise have been spread across multiple websites. Looking forward, we expect to continue to see some further consolidation of the market as a few large generic platforms really start to dominate.This handful of leading platforms are receiving increasing amounts of investment, P2P lending platform Funding Circle, for example, became the UK’s first Crowdfunding Unicorn back in 2015 and this March raised a further $100 million in investment. Nevertheless, we envisage that new niche sites focussing on specific sectors will continue to crop up, developing innovative twists on the standard crowdfunding models with varying success. 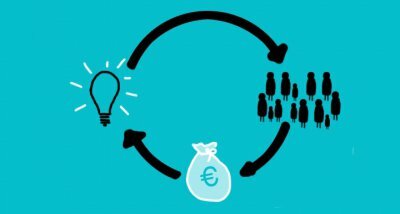 What are the survival rates of crowdfunding platforms? We analysed the platforms uploaded to the CrowdingIn directory since its creation in May 2013 to see which were still active and which were not. When we found a platform which is no longer active, we used Wayback Machine, to estimate which year it closed. Wayback Machine is a digital archive of the World Wide Web and provides information on when websites, including those that are no longer online, were last updated. The year in which a website was last updated was used as an estimate of the date that the platform closed. In some cases, Wayback Machine had no data on a website. In such cases, a platform’s last post on Twitter was used to estimate the year of closure. Using this data, we estimated that around 89 per cent of crowdfunding platforms in our directory survived three or more years. This is substantially higher than the three year business survival rate of 55 per cent reported by the Office for National Statistics (ONS) for businesses in the finance and insurance sector. It is important to note; however, that our estimated survival rate is likely to be an overestimate because to be eligible for inclusion on the directory, platforms must already be actively raising funds for projects and therefore will have already overcome some of the biggest hurdles to setting up a platform. Alongside those platforms that have died off completely, others have changed their business strategy. Microgenius, for example, ran as a community shares platform for three years before pivoting to become a portal for all community share offers on other platforms that meet national standards of good practice. Between 2013 and 2015, Trillion Fund helped finance renewable energy projects through lending-based crowdfunding and community shares. Due to changes in the renewable energy policy in UK, in 2015 Trillion Fund pivoted to launch Your Brand Crowdfunding, a white-label, lending-based crowdfunding service that enables businesses to crowdfund on their own websites. 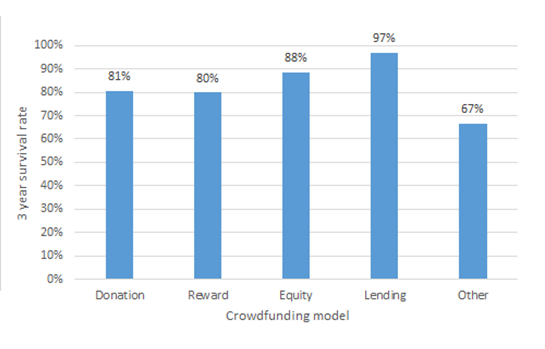 We found that donations-based platforms have considerably lower survival rates than the other crowdfunding models. We speculate that this is due to the smaller average amount raised through donations-based campaigns than campaigns using other models, as it is more challenging for these platforms to help projects raise the volume of money needed to be profitable. However, we think that the future is bright for these platforms, with institutional funders driving increasing amounts of funding to community crowdfunding campaigns by setting up matched crowdfunding pilots. One example of this is the Greater London Authority’s Crowdfund London pilot, which uses the Spacehive platform to pledge funding of up to £50,000 to citizen-led initiatives. Now in its fourth round, so far £1.24m has been pledged by the Mayor to 82 innovative local projects running crowdfunding campaigns. The campaigns attracted 9,543 pledges. Of the 77 successful campaigns, 74 went on to deliver successfully (or are currently in delivery). This represents £1.14m of Mayoral pledges attracting a further £1.6m from 9148 pledges.